Northern Pulp, a company owned by Paper Excellence, an affiliated company of the Sinar Mas Group, has been making news for bad behavior again in Canada. Recently, the Globe and Mail reported on the story of how a the company successfully shut down a signing event by the Nova Scotia-born author of a new book entitled, The Mill: 50 Years of Pulp and Protest. But shutting down free speech has only backfired on the company, making national news and publicity leading to the title being rapidly sold out entirely. 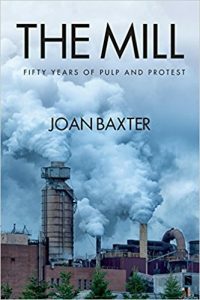 Prior to a local book signing event by the author, Joan Baxter, Northern Pulp sent a strongly worded letter of protest to the bookstore and its parent company, Indigo Books & Music Inc. A few days before the event, it was abruptly cancelled by the bookstore. However, the national news, editorial cartoons and social media outrage, propelled the book to much wider visibility that it had otherwise. Stock of the book quickly sold out, though it has been reprinted and its back in stock at Amazon.ca and in bookstores now. The controversy over the book comes amid a new proposal by the mill to pipe its effluent directly into the Northumberland Straight, raising the ire of local fisherman who see the risks from the new pipe as too high for their local lobster and fishing economy and their way of life, and have organized fierce resistence to the proposal. For more on this mill from the local community, visit the website of Clean the Mill. You can also view an excellent documentary released a few months ago telling the story of citizens speaking up about pollution at the mill, here.